Image from Freelancer on the Front Lines courtesy of NFB. (May 4, 2018 – Toronto, ON) To mark World Press Freedom Day, the National Film Board of Canada (NFB) is streaming Santiago Bertolino’s feature documentary Freelancer on the Front Lines. It is streaming free on NFB.ca today and tomorrow (see link below). After May 5, the film can be rented or downloaded for purchase on NFB.ca as well as on iTunes and Amazon. 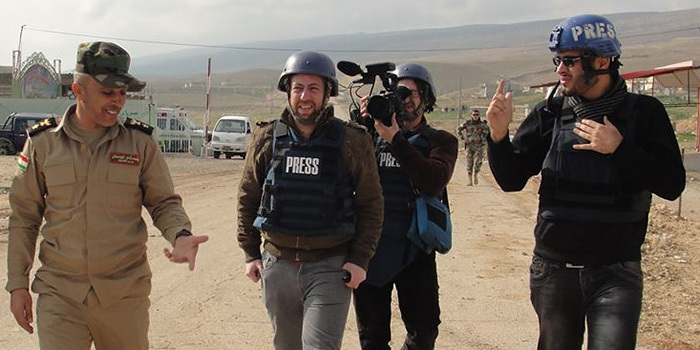 Freelancer on the Front Lines follows the journey of Canadian freelance reporter Jesse Rosenfeld, who has spent the last nine years reporting from the front lines on the biggest events shaping the Middle East. Whether covering the dashed hopes of the Egyptian revolution, the upheavals in the Israeli-Palestinian conflict from Ramallah or Gaza, the reality of refugee camps in Turkey, or the faultiness of Iraq’s bloody divisions, Rosenfeld is on a mission to share the issues on the ground with his readers. But to cope with the new communications jungle, choose the subjects he wants and make the front page, he must set himself apart from traditional mass media. Freelancer on the Front Lines has the thrilling pace of an action film, but tells the important story of the ups and downs of a new and unconventional kind of journalism. Born and raised in Toronto, Rosenfeld studied international development at McGill University, spending his student years engaged in social justice activism and working as a news editor at the student newspaper, the McGill Daily. Finishing his degree in 2007, he immediately packed up and moved to the occupied West Bank city of Ramallah where he started his international reporting career as a freelancer covering the Israeli occupation. Freelancer on the Front Lines screened as the closing film at the 2016 Montreal International Documentary Festival (RIDM) and has been shown in theatres in Québec and at festivals in Canada and abroad. By the end of 2018, the film will be screened at more than 100 universities in China as part of the Golden Kapok University Tour organized by the GZDOC Festival. An exclusive NFB-produced podcast, in English only, has also been launched on NFB.ca. Running 45 minutes in two parts, Jesse Rosenfeld sits down with journalist and documentarian Jesse Freeston to discuss the dangers and thrills of reporting from the Middle East. Freelancer on the Front Lines was produced at the NFB by Nathalie Cloutier and Denis McCready, with executive producer Colette Loumède. Click here to learn more about World Press Freedom Day. Click here to listen to the NFB podcast.